Background composed of Black Diamond Stone. Sun design composed of Gold Noir Stone. Due to natural variations in coloration of real stones and marbles, and because each top is individually hand-made, no two tops will ever look exactly alike. These subtle differences are your assurance that your purchase is a handcrafted work of art. 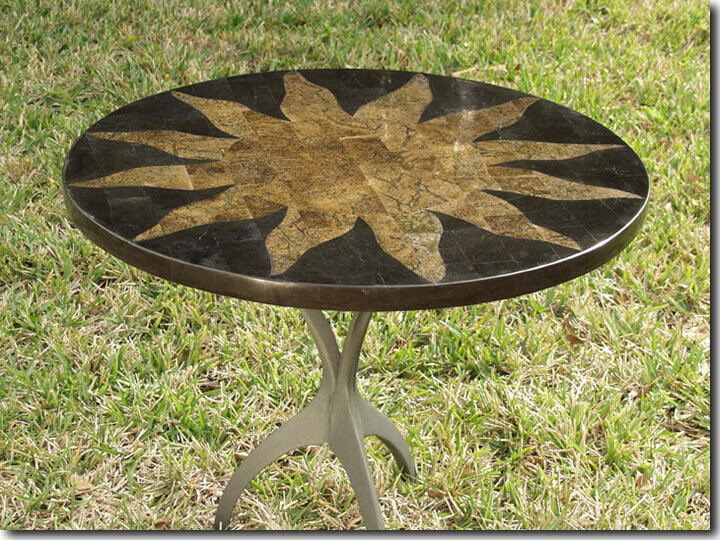 The Aztec Sun Table Top comes in 24" round, 30" round, 48" round, 25"x38" oval, 44"x74" oval, 44"x84" oval, and 38" x 108" oval sizes. Photos of all top sizes are available upon request. Click HERE to see the Aztec Sun Oval Top.